The Rota Filler 1000 is a manual pipette controller uniquely designed for one-handed operation. 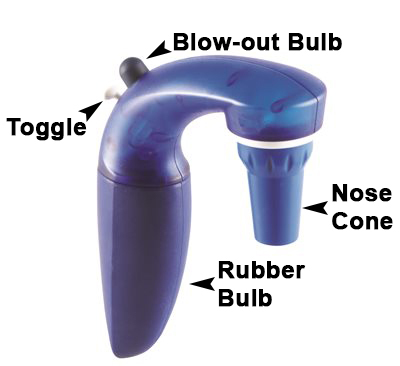 To operate, simply squeeze the main bulb, then push the toggle forward to aspirate, or back to dispense. Pushing the blowout bulb will expel any liquid remaining in the pipette. CAUTION Pipette performance can be impaired if liquid is aspirated into the Pipette Controller. If liquid is aspirated into unit, see cleaning instructions under the mainenance section below. It may be necessary to replace the filter. Push Blow-out-bulb as many times as needed in order to expel any remaining liquid in the pipette. CAUTION Always wear protective gloves and safety goggles when cleaning and/or exchanging the filter in order to avoid the risk of contamination and/or splashing. When pipette is filled, liquid should not drip from it when toggle is in center position. If the pipette does start to drip, disassemble pipette adapter, filter and filter adapter. Cafefully reassemble. Replace worn parts if necessary. See illustration for replacement parts.